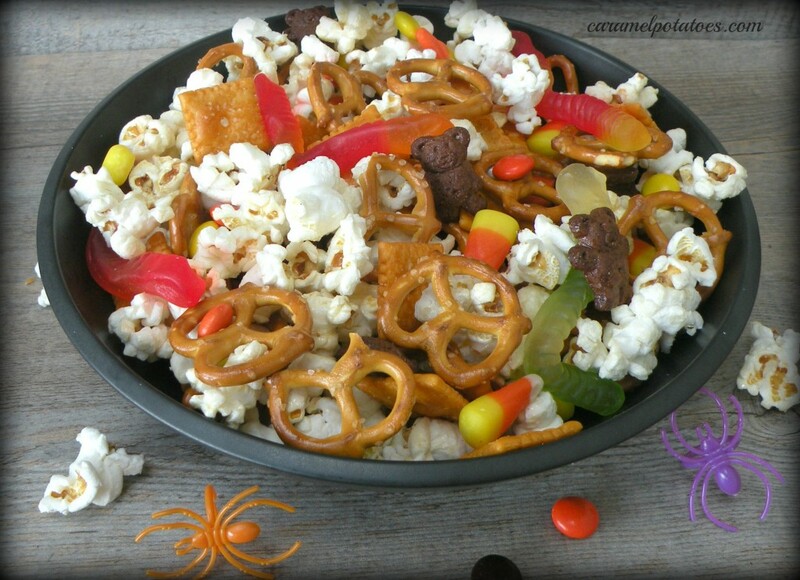 Stash the bowls of bagged candy and instead hand out these treats at your Halloween bash. This tasty treat by Caramel Potatoes is perfect to set out in bowls for kids and adults alike to help themselves to during your Halloween bash, or you could bag it up and pass it out to trick-or-treaters. Simply mix all ingredients in a big bowl. 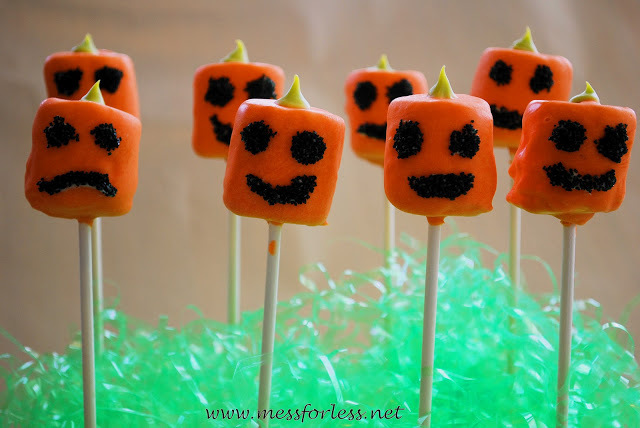 These pumpkin pops from Mess for Less are easy and cute — plus they double as a festive Halloween display... until they disappear, that is! Pour orange candy melts into a microwave safe cup or bowl and heat them a minute or 2 until they soften up to the point where you can stir them until they completely melt. Dip the tip of your lollipop stick into the melted orange candy. Then insert the stick into the marshmallow. The orange candy will harden and keep the marshmallow from falling off of the stick. Let the marshmallow dry on the stick before moving on to the next step. When it is dry and secure, dip the marshmallow into the melted candy, making sure to cover it completely. Use a spoon to drizzle some melted candy on the bottom of the marshmallow to get it covered. Shake off the excess candy melt back into your cup. If you skip this step, you will end up with very drippy pops. Let the covered marshmallows dry for about 20 minutes. Use a plastic foam block for this purpose. When the marshmallows have hardened, melt your green candy melts for the stem. When the green candy has melted, dip a clean lollipop stick in it. Scoop up a bit of the green candy using the stick. Then you will touch the stick to the top of the hardened orange marshmallow. When you do this, it looks a bit like a chocolate chip. This will be your stem. Let dry 10 to 15 minutes. When the pop is totally dry and hardened, dip the tip of a toothpick in frosting and draw a face on the pop. Then dip the frosting side into some black sprinkles. Shake off the excess sprinkles and your pumpkin pops are ready to go! These savory owls from FamilyFun magazine are a wise alternative to sticky sweet Halloween treats. They're so simple to make that the kids will have a hoot putting them together — and eating them up! Press on a pair of mini round cracker eyes (pull apart a Ritz Bits sandwich and use a half for each eye) and attach raisin pupils with a dab of cream cheese. Finish by pressing on an almond beak and almond slivers for the feathers. 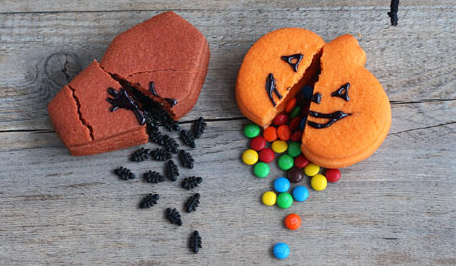 We love these break-apart cookies from Megan of Not Martha — they're a treat within a treat! If you're not a baker, she suggests using store-bought roll-out cookie dough to makes these super-cute treats.